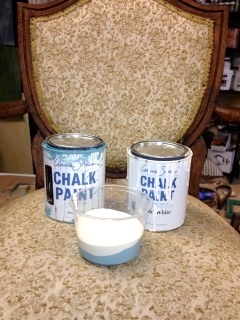 Yes, admittedly, I’ve gone a little chalk paint crazy, but even crazier for chalk paint than me is my dear friend Laine of the MissElaineous Studio in Cincinnati. Her studio is like eye candy for the soul and it was no exception last week when I stopped by for her open house. What caught my eye this time? 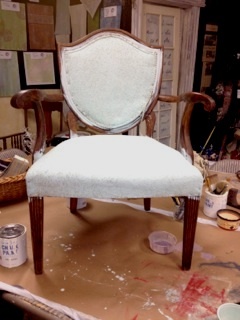 An upholstered chair completely painted in Annie Sloans Chalk paint. I have to say when I first heard she was going to try it, I was a bit doubtful as to how it would turn out, but I have to say it turned out pretty awesome. Fortunately, you don’t have to take my word for it, because Laine was nice enough to send me some photos and details so I could share the process with you! 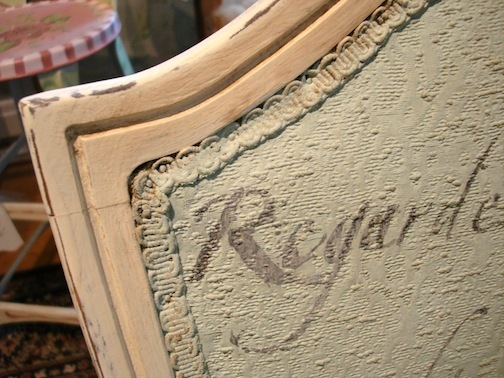 I have had people ask about using Chalk Paint on fabric – which I have done in the form of a stencil many times – but had never tackled an “entire” piece of furniture. 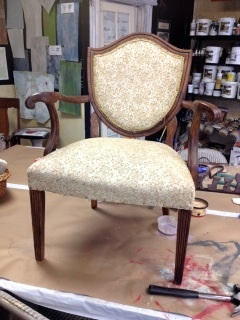 This lovely chair has been in my studio for years.. I had re-colored the wood a few times to shift with my ever-changing decor. But alas – I had never attempted to paint the FABRIC for goodness sake! 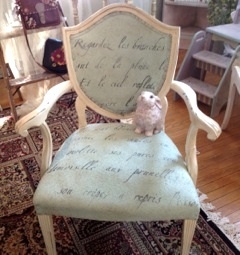 An innocent victim….. little did this chair know what was coming…. The chair is a shield back arm chair and quite comfortable really. The fabric is sort of a dimensional damask…likely made of a cotton or a blend. It was pretty thirsty stuff! Below I am playing with color choices. It was telling me it wanted to be “light and fresh” so I opted for a 50/50 mix of Old White and Provence. YUM!!! 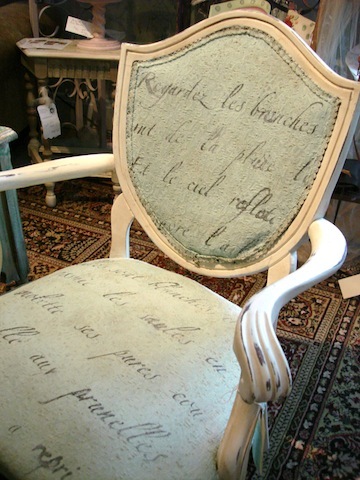 I brushed the paint on “heartily” and with great gusto using one of Annie’s swell brushes to smoosh the paint into all the nooks and crannies of the fabric. It actually went on pretty easily. There was no turning back! 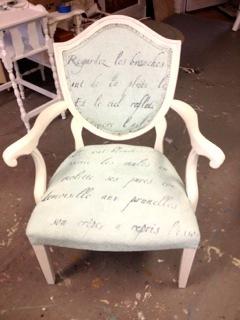 Here it is with just the fabric painted in the mix of Old White and Provence after two coats, admittedly – the second coat on the fabric was thinner… just to be sure I was reaching all the deep nooks! What have I done??!!! But wait – I actually LOVE IT!!! MY new little whimsical friend just needed a bit more TLC…So I WAXED the ENTIRE PIECE – fabric and all and that was the ticket! 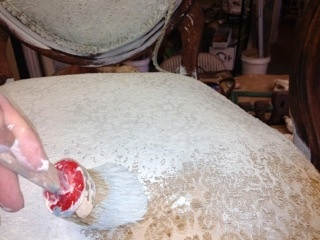 The wax made the painted fabric soft and supple – and kind of like leather actually. I wanted to call attention to the fabulous curves so I lightly sanded a few places on the arms, etc. 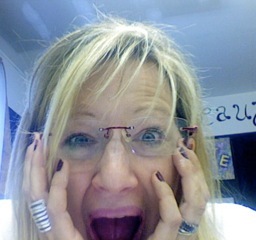 and WHA LAH!!! This little bunny LOVES IT!!! Even he can’t resist the French! You’re probably wondering what the chair is like to sit in and I have to tell you that it’s actually quite comfortable. It kind of feels like leather… not at all hard or scratchy like I thought it would be. Pretty cool isn’t it? So now do you all see why I love being at the MissElaineous studio? Note: You can visit Laine’s site at The MissElaneous Studio to see her new fall line-up of classes including one that I’ll be teaching there on September 22nd and again in October called Decorate Fabulously!